Monday morning and time for another double DT card from me, can you believe it's been two weeks since the last one? No, me neither. Over at Cupcake, my Cherie Gateau, Delphine has chosen Bookworm (I think the teacher in her is coming out!) as our theme. You could use an image showing a book, someone reading something or even a bookmark. We are lucky enough to be joined by our regular sponsors; Crafty Emma's Store and Crafts U Love. 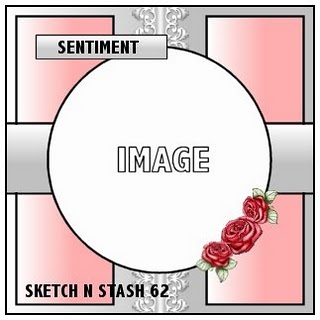 This is the fab sketch that Angie has created for us to play with this time over at Sketch n Stash. I've rotated it, as that worked better for me and you are welcome to do the same, so long as we can recognise the basic elements of the sketch. Don't forget to tell us about your new and/ or old, neglected stash. My old stash are the star dies. I've had them for a while, but I use them a lot. I luuurve stars. Can you tell?! Sketch n Stash are being sponsored by Stamp & Create and Kenny K, who are both offering very generous prizes. But don't take my word for it, head over to Cupcake and Sketch n Stash for the full details and to see the wonderful creations all my talented Teamies have made to inspire you. A fab card Fluff, the DPs and star embellies are perfect together. Gorgeous card sweetie love the image its fabbylicious. and I love MME papers too, they always have great designs. I just LOVE,LOVE thhis card!! Btw, i love all your cards...allways..*lol* But that image is so adorable and the colors are great! Have a perfect day! Hugs & Sunshine! that's clever of you to combine 2 DT cards.....it's a fab one with pretty papers and a nice (coloured) image! Love the card, Faye! Will make a great Fathers Day card!! So cute! Ohhh Faye this is just lovely..perfect image for fathers day me thinks hmmm.. I am sure I just heard Sam shout no more spending lol!!! GREAT! Love that patterned paper with this cute, cute image. WoW! Nice card...lovely image and great coloring! Love how you used those little stars! PS. hope Sweet Cheeks enjoys his nursery session! Cute image and I love all the stars you used for accents! This one's a corker, love it! Fabulous card - so fabulous in fact, that I don't even know where to begin!! Love the star border and fabby stars around the image which is adorable, btw!! Your papers are de-lish! I see you are fitting right in with the Sundae girls over there. I recently purchased that cupcake cutie and really must ink her up! Hope to catch up soon! 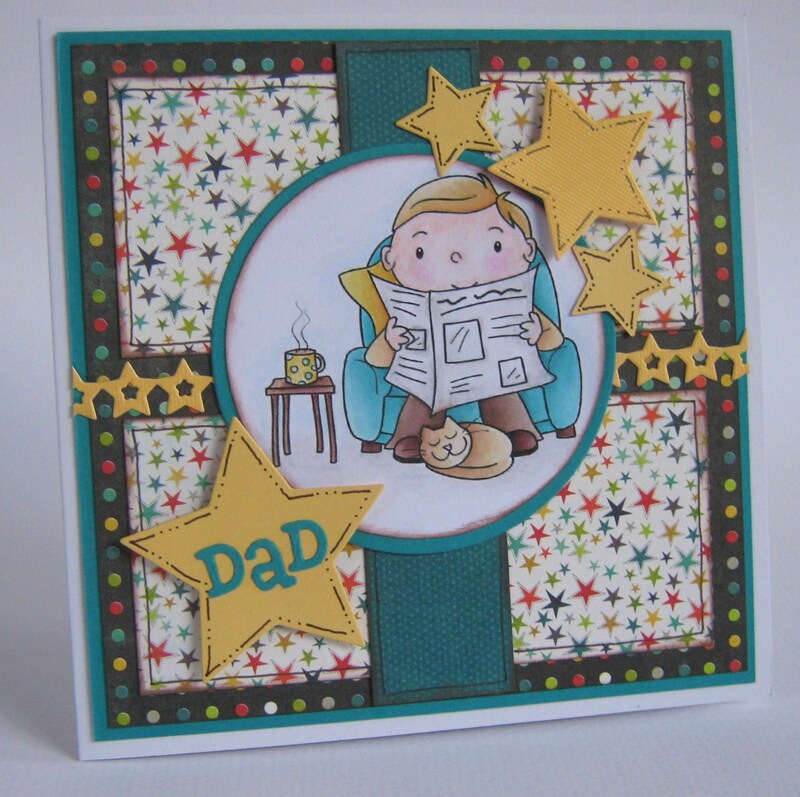 Another fab card Faye and loving the stars and the faux stitching, perfect. Oh this is fabulous Faye, love it. Ooh yes, lovely fabulous & wonderful, you've made some cracking guy cards lately, well you do always actually! Love the star die, must look up these die namics...or maybe not! Great card!! Love Dad hanging out reading the paper - lol! I am enjoying the cupcake challenge, stop by to visit mine if you get a chance! Oh how i want these papers they are so cool and starry!! !